This weekend, my wife Anette and I welcomed Dillon Jacob Spoon - all 7.5 pounds and 20.5 inches of him. We thank everyone for the well wishes and notes... we were truly overwhelmed by everyone's kindness and generosity. Though only a couple days into the journey, we have loved every moment =) A few pictures are below and I will be taking a short hiatus from email, the blog, and so forth. Please understand if there is a delay in returning emails / calls! 1. Apple's Facetime is made for experiences like this... in fact, it is why Anette, my parents and I all got the new iPhone. Facetime has allowed family and friends outside of San Francisco to 'spend time' with Anette, Dillon and I. It really is life changing. 2. Thank god for Amazon (and Amazon Prime). 3. Facebook too: with its ability to easily share updates, photographs and so forth with all of our friends and family. Everyone's feedback has been touching! Goodbye Dotster. Hello Media Temple (mt). So I decided to migrate everything to a dedicated server using Media Temple (mt). Things are now lightning fast and mt's customer support and responsiveness have been outstanding. The blog should be running faster than ever and it should be entirely stable. Thanks for your patience and big thanks to Danny Leffel (of InGameNow) and Russell Cook (of beRecruited) for all of the assistance. I am excited to announce that, starting Monday, I will be joining Polaris Venture Partners and will work out of the Dog Patch Lab on Pier 38. Over the last few years, I have had the opportunity to get to know the Polaris team and I am eager to begin working with them in a different capacity. I have enjoyed my time at eBay, Widgetbox and beRecruited, but have always wanted to move into venture. My two questions were: what is the right them and where is the right fit. Polaris is certainly the right fit and the timing is particularly exciting because I will be based in the Dog Patch Lab - a vibrant collection of entrepreneurs and start ups on Pier 38 off of Embarcadero (portfolio company LOLapps and ThingLabs launched here). The lab is operated by Polaris and focused at connecting entrepreneurs and helping founders conceive and build startups. If you read this blog, you know my interests: consumer internet, digital media, mobile and social media. I will also enjoy being exposed to other investment areas as Polaris is diversified across industries and stages: life sciences, growth equity and technology. If you would like to tour the lab or find a time to meet, drop me a line! - PolarisVentures.com - VCMike (Mike Hirshland): Blog, Twitter - RyanSpoon.com: Blog, Twitter, Facebook - TechCrunch: Polaris & Dog Patch Labs - Xconomy.com: "Dog Patch Lab - An Entrepreneur's Kennel"
Introducing New Blog Design... Thoughts? When I first started this blog, it was on a whim and I built it over a weekend on a hosted version of Wordpress. The theme I implemented and hacked-together worked well but didn't scale well with increased amounts of content, advertising, etc. And while much of my readership is via RSS and email, I was bothered by the overflow that become my blog.... so I finally mustered up the time and courage to hack a redesign together over the past few nights. So here it is: a new theme that is more of a "magazine" template. It is based on Arthemia and is very flexible / customizable. There several great features which aren't turned on because I haven't had the ambition or confidence to upgrade to the latest version of Wordpress (any help welcome!). I'd also love your thoughts - like it? Hate it? Improvements? Know CSS and want to help!? This Saturday, I will compete in the famed Alcatraz swim race for the seventh time and will joined by last year's winner and co-founder of InGameNow, Steuart Martens, and Widgetbox CEO Will Price. We will be swimming in the Alcatraz 100 swim race which was recently named one of the ten best open water swims behind other famous events like the Waikiki Roughwater Swim and the Manhattan Island Marathon Swim. It's clearly not tech related (so if you read this blog for tech news, I apologize), but I am frequently asked about the Alcatraz swim and, with the race a couple days away, I thought it was worthwhile to post a guide to swimming Alcatraz. Two Alcatraz Courses There are two Alcatraz courses: the most common is from the rock almost directly south into the Aquatic Park beaches. This swim is (if swum perfectly) 1.25 miles long and the last quarter mile is actually protected within Aquatic Park (in a cove near the wharf with a concrete opening for boats). The second course, shown below, is into the beaches of Chrissy Fields. This course is roughly 1.75 miles long and is far more difficult because it requires better sighting and mapping - in addition to better conditioning. The mixture of currents makes the Chrissy Fields swim very difficult. As an example, I swam the Aquatic Park course as part of the Alcatraz 100 race in 2004 and placed 2nd with a time of 28:14. Of course conditions were not equal, I swam the Chrissy Fields course in July 2006 and it took 39 minutes. Alcatraz Water Temperatures The hardest part about the swim is clearly the frigid water temperatures which can range from 57-63 degrees depending on the time of year and the city's weather. The first year that I swum the race, the water was around 63 degrees and last summer it was just under 60... I recommend a wetsuit, although Steuart swam the race last year in nothing more than a Speedo. Either way, it's important that you condition yourself for the water temperature and swimming in a wetsuit. Aquatic Park is a great place to get a feel for what the water is like and how different swimming in a wetsuit is. One piece of advice I give is that you will always find Aquatic Park colder because, on race day, your adrenaline is so great that it somewhat soothes the cold. If you are particularly worried, you can wear swim caps made of wetsuit-like materials - if you don’t have one, you can wear multiple latex caps. Always make sure that your cap is neon colored as its much safer should you need attention or assistance. If you can’t practice in Aquatic Park, it is recommended that you prepare by showering in cold water (seriously). Starting the Race Pretty simple and pretty gut-wrenching. Hundreds of swimmers - mostly in wetsuits - stand on the deck of a big cruiser-boat. The race director blows a shotgun and everyone dives in and races to shore. The stronger, more aggressive swimmers dive out first. If you want to avoid the crowds and are doing the swim more for accomplishment than for time, I recommend waiting for the competitive swimmers to dive in first. Be warned - NEVER aim for the swimmers ahead of you. They will most always be to the your right and, by following them, you will be much further west than they are by the time you reach that point! They have already fought the currents to get to their current positioning - if you must follow a leading swimmer, aim EAST. Also of note, it is ALWAYS better to overshoot East rather than West. Take a look at the images below used by GPS tracking - you will notice how off course some of the swims are. There is nothing worse or more difficult than having to fight the currents and swim upstream to correct earlier mistakes. It is always easier to swim downstream! 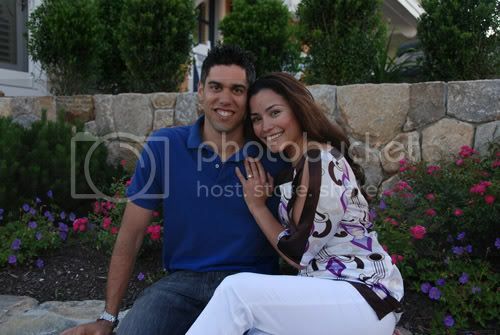 Over this July 4th weekend - where we vacationed in Cape Cod with my family - Anette and I got engaged! We actually debated whether or not I should post the announcement and picture on this blog. Anette finds it tacky and I have personally struggled with the balance / conflict between tech posts vs. personal posts. But now, a few days after the proposal, I've realized how important the web has been (despite being 'tacky') in communicating the news... and consequently, I don't feel awkward posting this information on a blog... and a tech blog at that. The other interesting aspect was how Facebook played a role in reaching our friends. Outside of phone calls, text messages and emails - I was really struck by the impact of simply changing my "Facebook" relationship status. Unlike my sisters, I am not an avid Facebook user who logs in multiple times a day (or even daily). I consider myself a reactive Facebooker - someone who logs in when drawn through SMS and email alerts. I suspected that most of my friends were also reactive users. By only changing our relationship status, we each received numerous messages from people who saw the news hit their Facebook Feeds - which means that people were logging in and actively using the Feed to monitor changes in their network. Fascinating considering the amount of activity most people's feeds contain and the rapidity of which we both started getting emails. There is no overlooking how important the Feed has become to Facebook's ecosystem. I haven't yet posted to Twitter... I can't bring myself to be that tacky (for now). - Bike: Almost entirely uphill. You go from sea-level to high in the Presidio - well above the Golden Gate's entrance. 90% of the bike is done is gear 1-1. - Run: Along Chrissy Field and up to the Golden Gate Bridge... which includes scaling very steep steps. When my dog Manny was diagnosed with Legg-Perthes Disease last year, there was little information available on the web about the disease, it's impact and the necessary surgery. So I documented the entire process (both Manny's experience and mine) on MyDogManny.com. I made the site in the hope that it might help other dogs and dog-owners overcome the debilitating and commonly misunderstood disease. I receive emails like the one below every couple weeks. This one arrived yesterday and really demonstrated the power of the internet and of content. I just wanted to extend my heartfelt thanks for all the work and time you put into your website (mydogmanny.com) and chronicling your dogs' progression through FHO surgery. We recently went through the same experience with our own dog. We were on the fence regarding the surgery, as our pet is older. Your experience convinced us that she could get through this, and the surgery was a huge success! Without your site to encourage us, we probably would have put her down. Thank you so much for the help and encouragement that your experience lent to us. We are looking forward to many more good years with our beloved little fur ball Peawee, a toy mix we rescued from a shelter. Sending good vibes to you today - you rock! Yesterday, we took an unbelievable snowmobile tour in Vail. I had never snowmobiled before - so we decided to take a 4 hour tour with Nova Guides (one of the big guide companies in Vail Valley). They took us out in groups of 8 and we had over 80 miles of national forest track available to ride. The tracks were about 20 minutes past Minturn on route 24 (which before I-70 was the only way from Vail to Denver) - passing through Redcliff, an relatively recently abandoned mining town. Here are some of the photos from atop the tracks at about 12,000 feet. You can see Breckenridge, Copper Mountain, Vail and some other local chutes. The highlight of the trip (other than riding around powder at 50+ mph) was seeing one of the riders in our group fall off his snowmobile and subsequently have it roll 400 yards down a bank of waist-high powder. The first video shows the view atop the mountain. The second is of the fallen snowmobile.